John has been in love with comics since he was first given an issue of "Swamp Thing" at way too young an age. He can be heard every week on the podcast "Panel on Panels" discussing all things comics and comics related. He is also a filmmaker and actor who can be seen performing in shows around the Portland area. In all the acts of superheroics and protecting the Earth from calamity, it’s sometimes easy to forget that X-Men is ostensibly a book about a school. We all know the Xavier Institute secretly houses the X-men and all their crime fighting gear; however, it’s also home to a group of scared and confused young mutants just learning their powers. These young people are the focus of the latest X-title Generation X #1. In this first issue we meet a ragtag group of new mutants just entering the institute. Headmaster and X-Men team leader Kitty Pryde can’t possibly juggle all the responsibilities of her demanding positions. So, she’s called in everybody’s favorite 90’s mallrat Jubilee to help mold these youngsters into a new team of heroes. It’s a big thrill for longtime X-Men readers to see Jubilee step into a leadership position. For so long, she’s been the kid sister of the team, and to see her come into her own and become a mentor to young mutants is very satisfying. One of the strengths of this first issue is its focus on character, and rather than leaping directly into super villain fighting, we get a sense of the characters and their dynamics. This team has a lot of dysfunction: It’s clear these characters are young and unproven. There’s much infighting and self-doubt, and this will no doubt be the center of conflict for issues to come. 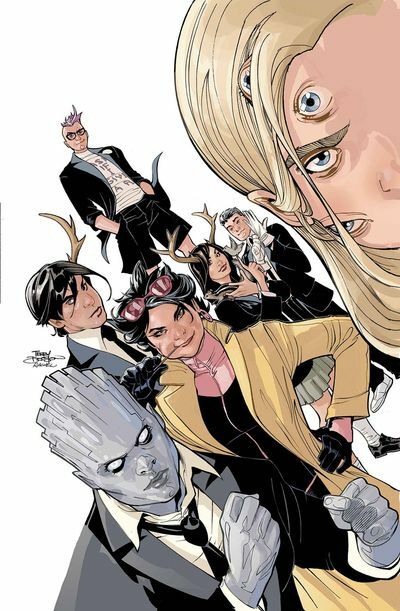 Generation X #1 feels like the right step in the continuation of the Marvel X-Men relaunch. It’s a direct appeal to a younger market who will no doubt relate to this mismatched bunch of characters. A treat for X-readers new and old, Generation X #1 is another success for Marvel’s Resurrxion relaunch. The X-Men are back and better than ever! Check out all of our Resurrxion comics! When one thinks of the Guardians of The Galaxy it’s impossible not to immediately conjure up images of Rocket. He’s everyone’s favorite roguish raccoon (though don’t let him catch you saying that). Fresh off his critically acclaimed appearance in Guardians of The Galaxy Vol. 2, Rocket launches into a new solo series all his own, the appropriately titled Trash Panda #1 Rocket #1. We initially find Rocket in a bar regaling the bartender with tales of his recent Earthbound adventures. Into the bar walks Otta, an old flame from Rocket’s past who left him jailed and heartbroken last he saw her. Of course, she needs his help, which involves Rocket returning to his criminal ways. Rocket is obviously suspicious, but with the fate of Otta’s planet at stake he just can’t help but get involved. Writer Al Ewing crafts an extremely clever intergalactic crime story in Rocket #1. This book is as much Ocean’s 11 as it is Guardians of The Galaxy. The idea of Rocket using his natural raccoon abilities of hypersensitive touch and hearing to be a safecracker is ingenious. 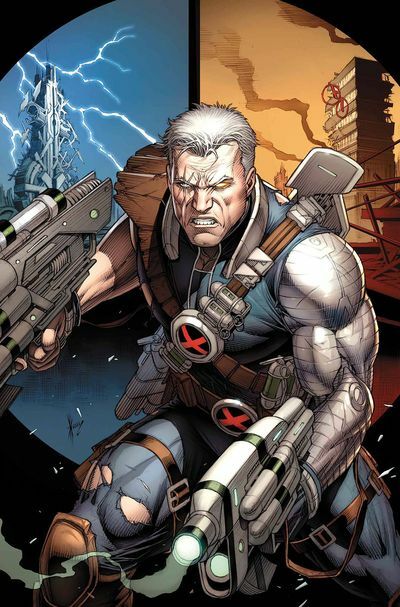 Ewing also uses the plot to paint Rocket as a reformed thief trying to avoid getting pulled back into the game. It’s a nice reminder that the Guardians characters exist in a darker, more crime-ridden part of the Marvel Universe. Artist Adam Gorham obviously has a ball creating a ragtag crew of animal inspired aliens. 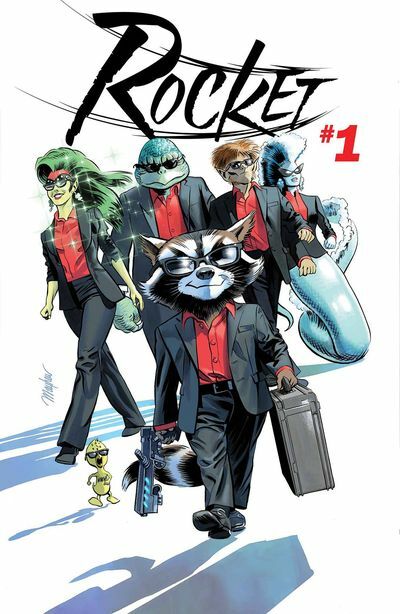 Seeing Rocket and his crew in stylish matching suits plays into the fun, caper vibe of the comic. It’s exactly the kind of story and attitude we expect of Rocket and it’s clear from this first issue that he’s in the hands of a perfectly matched creative team. If you’ve seen the movies or loved the Guardians comics and just can’t enough of this acerbic raccoon, then Rocket #1 is the perfect jumping on point for his solo adventures. After the extremely successful miniseries Monsters Unleashed, Marvel and writer Cullen Bunn have decided to continue the monster mayhem in an ongoing series of the same name. Monsters Unleashed #1 has the fun spirit of the miniseries, but sets up a new adventure. In the first issue, 11-year-old Kai Kawade (better known as Kid Kaiju) has the ability to bring the monsters he draws to life. Following the events of the miniseries, Kid Kaiju decides to use his monster friends to help save the world. One of these acts of heroism has drawn the ire of the super-powered cleanup crew Damage Control. Giant monsters may save the day but they do create an awful lot of property damage. Luckily Kai has a couple of companions to help him train on how best to deploy his team of monsters. A member of a legendary family of monster hunters (Elsa Bloodstone) is Kai’s personal bodyguard and mentor. That is, when she hasn’t run off to fight vampires. Elsa helps implement effective battle strategies picked up from a lifetime of combating monsters. Beyond the battlefield, Kai has a robot tasked with giving Kai a proper education in the subject of super-heroism. And Kai’s going to need all the help he can get because giant monsters aren’t the only threat coming his way. A group of legendary Marvel super-villains have banded together to put an end to Kid Kaiju and his beloved monsters. There’s obviously a lot of love for this genre from the creative team of Bunn and artist David Baldeon. This book knows what’s it audience is looking for and delivers. It’s filled with all the large scale monster battles Marvel readers crave. It will be fun to see what new massive action this creative team can dream up each month to face our gang of heroes. Rose is a new series fantasy series that embraces the classic archetypes with gusto. There are magical kingdoms, evil sorcerers, and a young hero embracing her destiny. The story is set in a world that for years was protected a group of warriors known as Guardians. These brave soldiers defended the land with animal companions called Khats. The Guardians were eventually defeated by an evil sorceress named Drucilla, who destroyed most of the land and outlawed magic. Rose #1 begins ten years later. A young girl named Rose possesses the magic powers of a Guardian. Fearing for her daughter’s safety, Rose’s mother makes the girl promise not to use her powers. Rose is forced to flee her village and head into the woods when tragedy strikes. And that’s where she meets up with the leadership of the resistance against the evil queen. This first issue definitely feels like the beginning of a fairy tale saga. Like any good first issue it’s laying the groundwork for the series. Writer Meredith Finch is obviously inspired by a lot of classic fantasy stories. But she clearly wants to put her own spin on it without alienating readers looking for a traditional tale of a magical realm. The art does a lot to create an otherworldly vibe. Artist Ig Guara offers up a number of striking and unique character designs. The characters and the world around them shift between beautiful and grotesque. It leads to a sense of both wonder and dread that’s perfect for this story. Drawing the reader ever further into a world with exciting magic and creepy horror. Rose is definitely a book for fantasy fans. However, it’s also a story constructed out of such classic and archetypical building blocks that anyone can pick it up and get engrossed. Is All New Wolverine Immune? One of the most popular and acclaimed titles of the last X-Men relaunch was Tom Taylor’s All-New Wolverine. It saw fan favorite Laura Kinney take up the mantle of the fallen Wolverine. And All-New Wolverine is the only returning title from the previous generation of X Books as Marvel announced the new X-Men Ressurxion initiative. An Alien Ship! A Dying Passenger! In All New Wolverine #19 there is a continuation of Laura’s journey that began last year. But a couple of things are revamped for the new era of X-Men. One of the biggest changes is a redesign of Wolverine’s costume. It’s now very reminiscent of the costume Wolverine sported in the X-Force books. Laura now dons a sleek, black tactical outfit. Her loyal companion Gabby, has upgraded the costume to be completely bulletproof. Gabby points out getting shot still hurts, even if you have a healing factor. Issue 19 is also the beginning of a new story arc. It kicks off with an alien ship crash landing. Ironheart makes a guest appearance and she prevents the crashing ship from leveling Manhattan. The badly injured alien pilot has just two words for Ironheart–Laura Kinney. Laura is just as baffled about her connection to this alien as Ironheart or the SHIELD agents monitoring the situation. Even more baffling is the mysterious virus that lead to a quarantine of Roosevelt Island. All-New Wolverine has been one of Marvel’s strongest since it’s launch. And it’s new story arc begins with the same energy and intensity that made past issues a hit. Putting Laura at the center of a mystery with such high stakes will surely give Wolverine fans the charge of excitement they’ve come to expect. Plus, a number of beloved Marvel characters make cameo appearances in this first issue. But make no mistake, this is Laura’s story, and she’s here to do what she does best. Everyone dreams of traveling to a fantastical realm. It could be to see impossible wonders. Or maybe just to escape their everyday existence. So, what happens if you meet someone with the power to take you to another world filled with magic and fantastical creatures? And what would you do to get there? These questions are at the center of Image Comics new fantasy book Black Cloud #1. Black Cloud #1 focuses on Zelda, a mysterious young homeless girl wandering the streets begging for money. However, she has a secret. She’s from a magical world–one she can travel to at her discretion. In addition, she can sell these trips to wealthy members of society at whatever price she names. This power would seem to offer her a solution to her financial woes. But as the story progresses, it’s revealed that this other world may not be as welcoming as initially expected. And the people willing to pay for this trip likely possess sinister motives. This a fantasy story that also feels very timely. It focuses on economic disparity and the clash of classes, all surrounding a magical mythology. The writing team of Jason Latour and Ivan Brandon develop a very conflicted hero. She exists in a very complicated and relatable world. And her abilities are used as a metaphor for drug dealing. In this analogy, the writers able to criticize the nature of spoiled rich kids seeking any kind of high–whether it’s drugs or, in this case, magic. The art in this type of book can really be make or break the story. But Greg Hinkle delivers a very interesting take on a mystical realm. Instead of pristine and gorgeous landscapes, it’s a grimy, art deco, noirish aesthetic that evokes curiosity about the details of this new world. Overall, this is a fantasy tale with a lot of depth. It also has some great story threads that will surely be picked up in future issues. This week, DC launched a series of crossover one-shots featuring their characters and classic cartoons from Hanna Barbera Animation. The most outrageous and unexpected of the bunch is Suicide Squad Banana Splits Special #1. The Banana Splits are a pretty deep pull from the Hanna Barbera library. It was the company’s first foray into live action content and a bizarre team up with HR Pufnstuf creators Sid and Marty Kroft. Focusing on a rock band made up of fuzzy animals originally played by actors in costumes. So, how does a band of cuddly kids performers cross paths with the lovably deranged members of Task Force X? The answer is, of course, quite complicated. While on their way to play a gig, the Splits are mistakenly arrested and tossed into Belle Reve Penitentiary. At the same time the Suicide Squad has come under heavy fire on their latest mission. This leaves team members in a precarious situation. They’re in need of new Squad members. And they turn to Belle Reve’s newest inmates, who are even more off the books and expendable than the original squad. Now armed to teeth and equipped with military tactical outfits the band of animal musicians head out to the rescue the Squad. Each Banana Split is paired up with a different member of Task Force X as they take on an army of creepy robot children. This book is truly loopy fun. It’s nice to see DC be willing to take chances with their characters like this. Writer Tony Bedard embraces the chaos and insanity of this team up. And he does it with gusto giving us an action packed and hilariously weird story. He even goes so far as to capture the bizarre speech patterns of the Banana Splits in his dialogue. Artist Ben Caldwell gives the Suicide Squad a cartoonish makeover to better fit with their more kid-friendly companions in a story that is anything but for children. Mike Danny isleft What happens when the Living Weapon loses his power? Syncing up perfectly with the release of his new Netflix show, Danny Rand, a.k.a Iron Fist, spins out of the acclaimed Power Man & Iron Fist and into his own ongoing adventures. Iron Fist #1 features a very different Danny Rand. He’s no longer the Iron Fist. Danny is left powerless and lost following the destruction of the magical city of K’un L’un. We find him drifting around the world of underground fighting rings. He’s taking more and more dangerous fights in the hopes of once again feeling like the Living Weapon. Is Danny Losing His Powers? There has always been a lot of dramatic potential in comics for a hero losing his powers. This book is no exception. Writer Ed Brisson fashions a much darker Iron Fist story than we’ve seen before. Without his powers Danny is forced to confront who he really is. He’s spent so much time with the mantle of the Iron Fist that it seems he’s lost some of his humanity. While this is an existential character story, it also features the highly kinetic kung fu sequences Iron Fist fans crave. Mike Perkins draws the action exceptionally well.He mixes a brooding noirish vibe with intense and fast paced fight scenes. Colorist Andy Troy deserves a shout out for his bleak minimalist palette that pairs well with the moody and somber tone established by Brisson and Perkins. The first issue does a great job of dropping us back into the world of Iron Fist. It puts us inside the head of Danny Rand as he adjusts to his new status quo. The final few pages hint at a much larger story that’s brewing. However, keeping things somewhat grounded to start is great call. Comics aren’t just for kids, is a refrain you’ll often hear from fans and it’s true. Marvel took things to a new level though with their mature content imprint MAX. Created in 2001, Marvel MAX focuses on darker heroes from the Marvel universe or creating new more morally complex characters. MAX’s R-rated comic content gives adult readers a more grown up reading experience. He’s a half-vampire, half-human vampire hunter. And he uses an arsenal of extreme weaponry to slay the undead. The MAX line gave creators the opportunity to tell the scary and violent stories Blade fans had been waiting years for. Deadpool has long been a fan of four letter words and extreme violence. So, his MAX book allows him to really cut loose and be the best mercenary he could. This version retains the humor that made the character so popular. But it also frees the creative team of the limitations of a mainstream book. The result is one of Deadpool’s craziest adventures. Wolverine’s berserker rage is on full display in this series. He’s been freed of the X-Men continuity and content restrictions. Now Wolverine is turned loose in a more gritty and noirish story. The violent and brooding world of Wolverine fit perfectly with the darker, more grown up tone of the MAX books. If any character was made for a MAX book, it’s Frank Castle. And he’s finally able to deliver the bloody retribution he had been talking about for decades. Writer Garth Ennis was able to dig deeper into the psyche of The Punisher than ever before. Yet the book still delivers some of the finest action sequences in the character’s history. If we can thank the MAX line for anything it’s the creation of Jessica Jones. She’s now a mainstay of the Marvel universe. Jessica was introduced in the Alias gritty detective series. Writer Brian Michael Bendis gives is a beautifully flawed and compelling protagonist. But he also shines a light on the more human side of superheroes. It’s been a tough few months for the King of Atlantis. He’s dealt with an invasion of his home. He’s been involved in a potential war with the United States. And his followers are questioning the woman he married. But things are looking up. Aquaman has received a request to help his former enemies–The Aquamarines. This group is a paramilitary unit with DNA that has been spliced with sea creatures. As a result, they have the ability to shift between human and sea life form. They need the assistance of Aquaman to investigate the sudden radio silence of a naval base. Arthur agrees to help the team. The silence may be connected to a mysterious substance known as Strange Water. And Aquaman has encountered it before. Aquaman #19 is an unusual story line for an Aquaman adventure. Typically Aquaman is leading armies of sea creatures against supervillains. Or he’s debating diplomatic strategy as the leader of Atlantis. However, this story casts Aquaman in the role of detective. It emphasizes a slow sense of creeping dread as Aquaman and the Aquamarines investigate the island base. Writer Dan Abnett uses the opportunity to pick up on some characters and story threads he started on the New 52 Aquaman. It’s a refreshing change of pace for one of DC Rebirth’s strongest titles. This is definitely painted as a horror story. And it and delivers a villain that even Aquaman may be unable to defeat. This issue shows the creepy tale of terrifying sea life. But it also continues to develop the relationship between Aquaman and his fiancé Mera. Their relationship is really at the center of this whole series. And seeing her fearlessly back Arthur up further solidifies their strength as a couple.